A symmetrical open plane curve formed by the intersection of a cone with a plane parallel to its side. PARABOLA is a family owned Montana business. The products that we offer for sale are the SCOPE-TRU ALIGNMENT BAR, US Patent # 8745914; and the RETICLE-TRU ALIGNMENT DEVICE, US Patent # 8800154. These tools are designed to be used primarily by the professional gunsmith, technicians working at retail or wholesale sporting goods stores, and the serious at-home guncrank. Each tool will greatly facilitate the telescopic sight mounting process, no matter what your skill level may be. Every part of the SCOPE-TRU product and package is “Made In Montana”. There are numerous different business enterprises that play a specific role in the making, packaging, and marketing of the SCOPE-TRU. Each particular business involved is based in Bozeman, Montana. In addition, the Acetal model RETICLE-TRU ALIGNMENT DEVICE is also CNC machined out of solid Acetal blocks by Midwest Welding and Machine in Bozeman, Montana. The Aluminum model RETICLE-TRU is CNC machined from solid blocks of Aluminum by Advanced Innovation in Belgrade, Montana. The plastic clamshell, shipping boxes, and rubberbands for the RETICLE-TRU originate from companies outside the state of Montana. When you order either a SCOPE-TRU or a RETICLE-TRU from Parabola, each tool will be inspected, approved, packaged, and shipped by Jerry–the innovator of the tools, and the owner of the business. 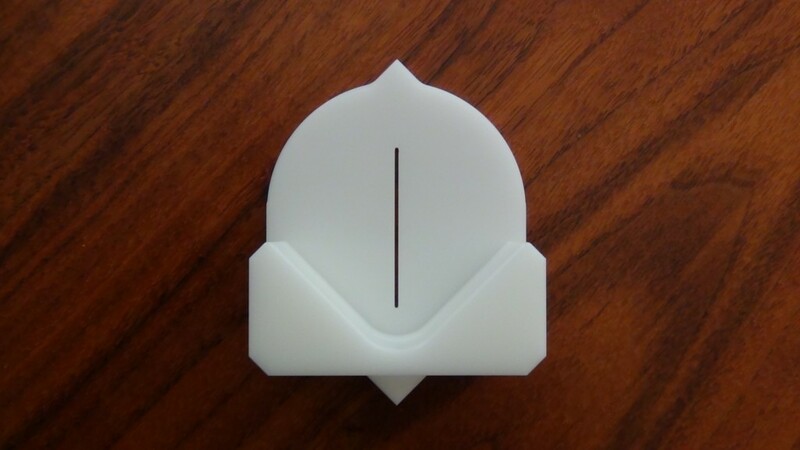 A single block of precision machined Acetal or Aluminum with top and bottom indicators. reticle on a telescopic sight previously mounted to the firearm by means of the un-aided eye, or by various other methods. A. PRIMARY METHOD — Both the bottom and top indicators are utilized. The bottom and top indicators are aligned on specific index references on the central axis of the firearm. The bottom indicator may be indexed upon: references on some rifles such as the tang, the groove in the tang, or the bolt; references on a shotgun such as the receiver; references on a handgun such as the frame, or backstrap–while at the same time the top indicator may be indexed upon references such as the scope tube, elevation turret, front bell of the scope, barrel, front sight, or barrel bead. B. SECONDARY METHOD — Only the bottom indicator is utilized. The bottom indicator is aligned on a specific index reference on the central axis of the firearm. 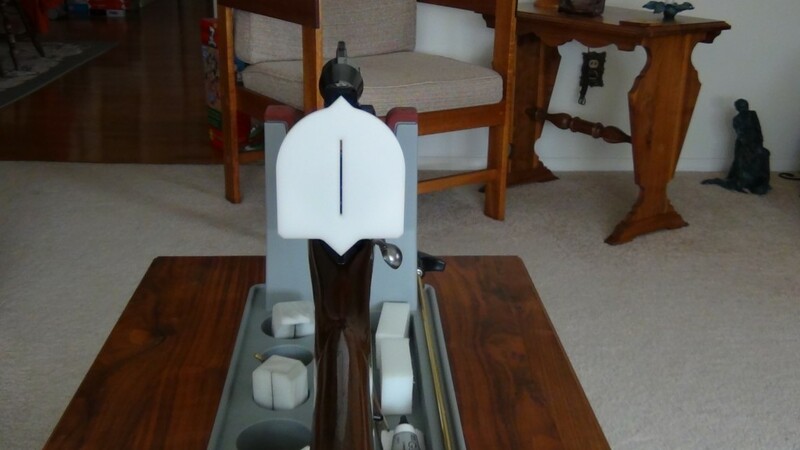 The bottom indicator may be indexed upon: references on some rifles such as the tang, the groove in the tang, or the bolt; references on a shotgun such as the receiver; references on a handgun such as the frame, or backstrap. C. AUXILIARY METHOD — The bottom flats or outboard corners are utilized. The flats or beveled corners are aligned with either a short straight-edge, or a short section of a cleaning rod that is temporarily resting on top of the mounting base in such a manner that the object is at 90 degrees to the axis of the firearm. The initial purpose of this method was to mitigate those situations where the ocular may be off-set from the central axis of the firearm, either due to errors in machining, or improperly installed and aligned “dovetail front/windage adjustable rear” style rings. However, this method also works very well with the picatinny rail system so commonly used today, and this is especially so if mounting a scope that has very high turrets, as the turrets may in some cases obscure the view of the barrel. The RETICLE-TRU ALIGNMENT DEVICE is a precision tool designed by Jerry Schmidt for aligning the reticle when mounting a telescopic sight to a firearm. 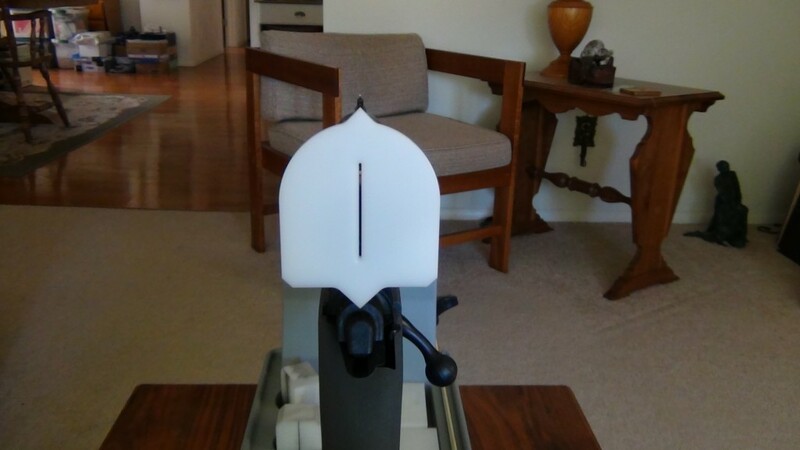 This unique tool will accomplish the task without the need for a bubble level, and without the need for a distant external reference object–in effect, the device can function as a “stand alone”. Therefore, because no external reference object is needed, the technician can mount the telescopic sight in a small room absent of windows, or even out in the field, where often there are no man-made horizontal or vertical references present–objects such as either a roofline or the corner of a building to obtain visual cues from–to align either crosswire upon to achieve a plumb or level reticle. In addition, because the device does not depend upon the use of a bubble level, the technician has no concern for inadvertantly moving the firearm off of level while working at the vise, or breaking delicate parts in the busy shop. The occasional hunter or soldier who might consider bringing the device along while out in the field need give no concern to breaking the device, for it is comprised of a singular block of either Acetal or Aluminum, having no delicate parts that can bend or break. 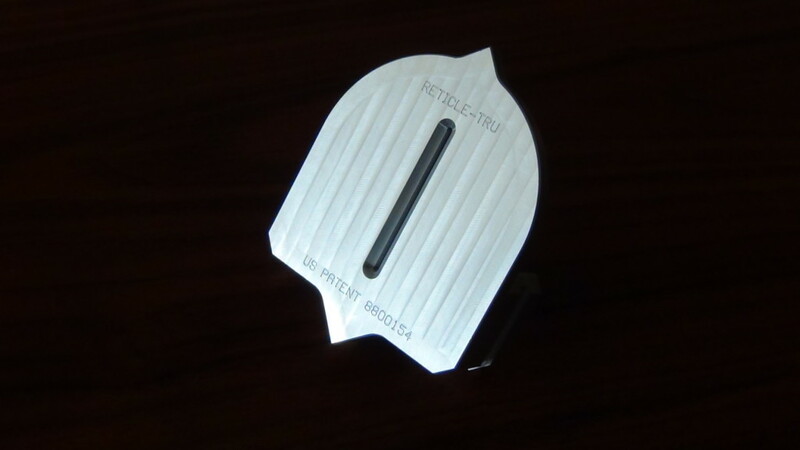 The RETICLE-TRU ALIGNMENT DEVICE–a tough, versatile gadget for the serious gunsmith and marksman. 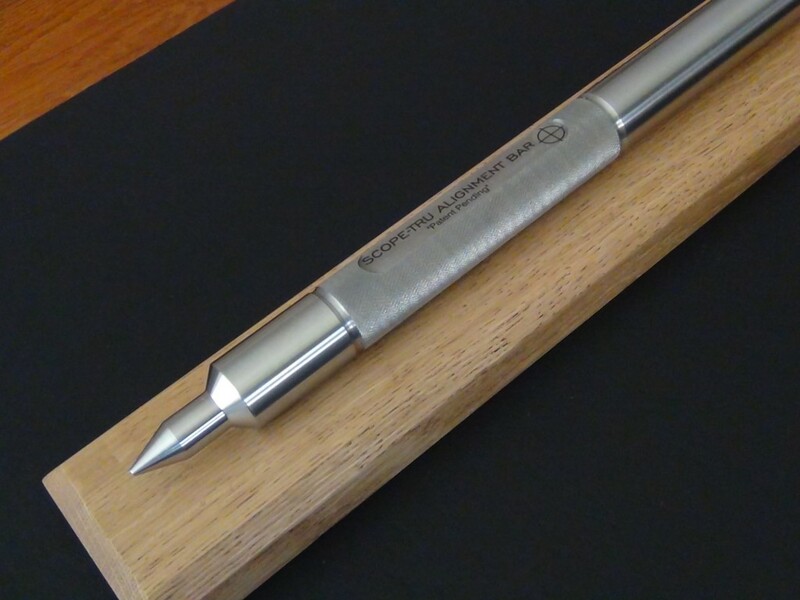 A single elongate cylindrical precision Steel rod with front and rear indicators. The front and rear indicators serve as axial projections of both rings, and how the axis of those rings relates to the axis of the barrel. Therefore, the tool will ultimately reveal any misalignment of the scope ring axis as it relates to the barrel axis. Used according to instructions, the tool will also reveal any differences existing between the front and rear scope ring heights. A. INSTALL and ALIGN the “scope ring to bore axis alignment” of “dovetail front/windage adjustment rear” style rings; whether they are manufactured by Leupold, Burris, Redfield, or Millet. B. INSTALL and CHECK the “scope ring to bore axis alignment” of “dovetail front/dovetail rear” style rings; whether they are manufactured by Leupold, or Burris. C. ALIGN the “scope ring to bore axis alignment” of “windage adjustable cross slot” style rings; whether they are manufactured by Weaver or Millet. D. CHECK the potential “scope ring to bore axis alignment” of several other types of rings; whether they are Weaver removable rings, Talley one-piece mounts, Ruger original factory rings, or picatinny style rings. 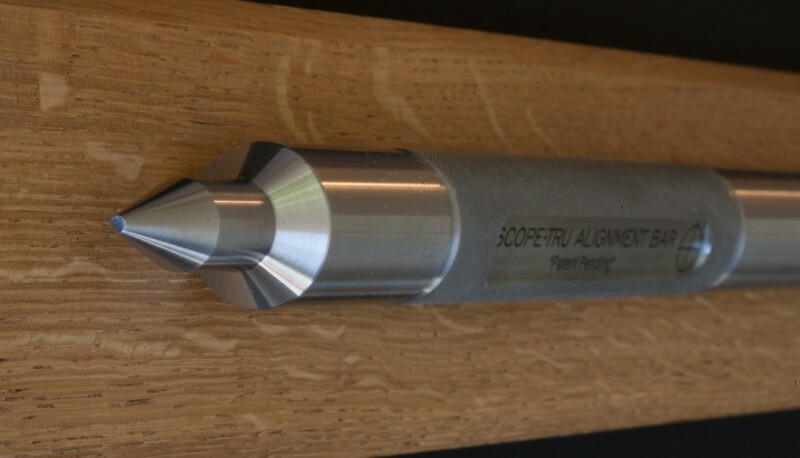 The SCOPE-TRU ALIGNMENT BAR is a precision tool designed by Jerry Schmidt for INSTALLING and CHECKING the alignment of several different types of scope ring and base systems. By using the tool for these ring installations, the rings can be installed with considerable precision, such that both the front and the rear rings are in nearly perfect axial alignment with each other, and in nearly perfect parallel alignment with the axis of the bore. Aligned thusly, each ring is subsequently “squared” at 90 degrees to the axis of the bore. When scope rings are aligned in this manner, the scope tube itself remains stress free, and the “ring kinks” or “witness marks” so commonly seen in everyday riflescope installations are essentially eliminated. In addition to this, precision parallel “ring to bore axis alignment” will result in greater long range accuracy, minimizing or eliminating progressive windage error at longer ranges that extend well beyond the distance the rifle is zeroed for. Finally, this level of precision ring alignment will ultimately assure that the windage adjustment turret of the scope will remain at or near mechanical center. It is then that the riflescope will offer the best performance it was designed for.